Photographer: Luigi + Iango. Model(s): Kendall Jenner. Source: Vogue Japan. Stylist: Anna Dello Russo. Makeup: Georgi Sandev. Hair: Luigi Murenu. 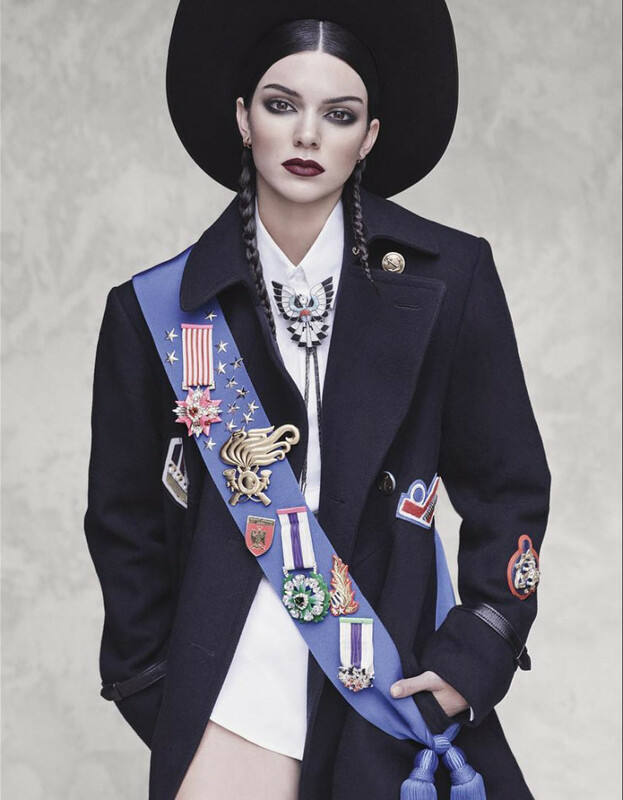 Kendall Jenner rides on High in Fall’s Haute Fashion preview shot by Luigi & Iango for Vogue Japan, October 2016. 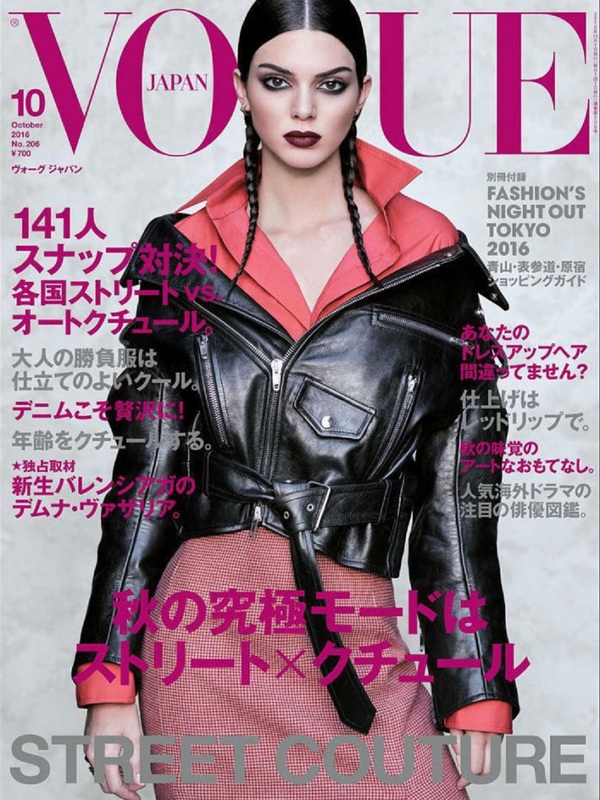 This model-of-the-moment goes for a double hitter, following the epic September Issue with this stunning Vogue Japan Cover. The art of creation is lost in a dream as all things go crazy in the heat of extreme. Kendall brings biker-chic to the cover, donning duds from the Balenciaga 2016 collection. 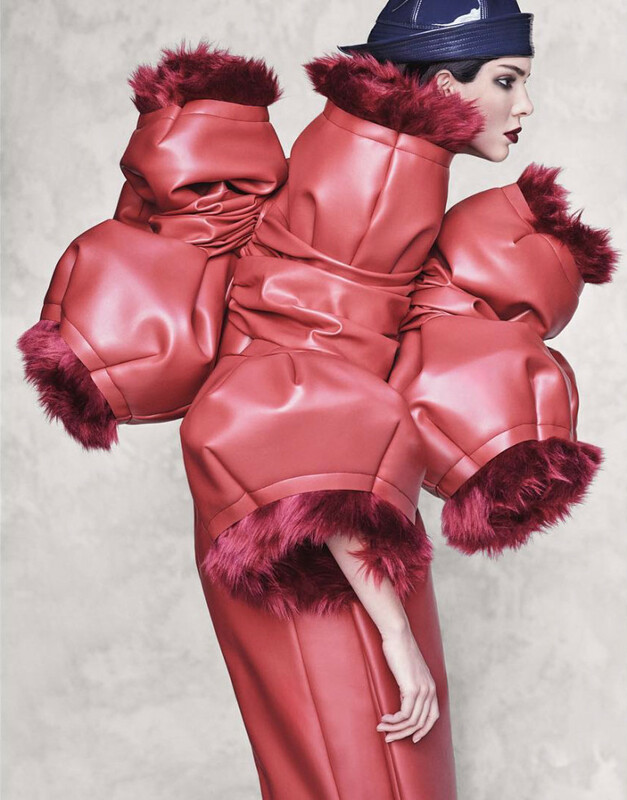 Capturing the essence of Comme des Garçons excess, she stands to the side wrapped in an avant-garde straight jacket. Leaning forward she’s held up by the forces of sheer will, while cast off by the winds of change we watch her walk into the center of strange. Double-sided sleeve structures seem to grow from the middle, while fur-lined, pink holes poke out all around. Sartorial art speaks as a symbolic sign of the baggage we need to unload. In one of strangest shots of the story, this image incites a sense of poetic symmetry. Haute Couture doesn’t just follow the rules, rather, it imparts upon us its wisdom. Yohji Yamamoto designs a billboard like coat, with playful prose written all over it. Anna Dello Russo brings layered looks to fashion’s forefront – as accouterments are aplenty – a plethora of pinned pieces stagger across a shoulder strap as belted decorations dangle in place. Beauty breaks from the usual scene as Georgi Sandev connects this cosmetic theme. New eye looks have evolved, with deep shadow lining the lower lid and a lighter shade covering above. Mascara is minus this season, as the overriding intensity comes from the darkened brow. Blown out and beautiful, the face takes on an ethereal flavor as the skin emits an otherworldly glow. Lips exceed the limits of lovely with a rich burgundy tone that goes to black. Clean’s never been so extreme, as rich features fuse with darkness all about. 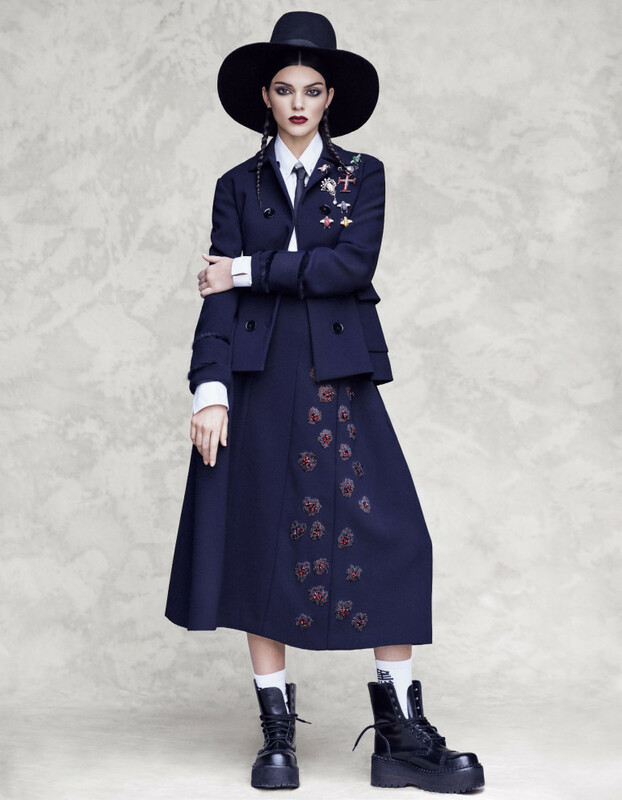 Hairstylist, Luigi Murenu, brings braids that sing, as many have named Wednesday Addams as the inspiration. The catalyst of such coiffure is captured under a symphony of styles, from a fur caster chapeau with ears flaps sticking out, to a Dixie cup sailor-hat and a military peaked-cap. Talking Hats are the Thing – with a tall, white fur marked with “Strict” and two top hats branded with “Killer” and “Girls” respectively. Avant-garde excess breaks from its usual presentation in this blending of hard and soft. With feathers worn upon my back ~ I’ll fly so high I’ll never come back. 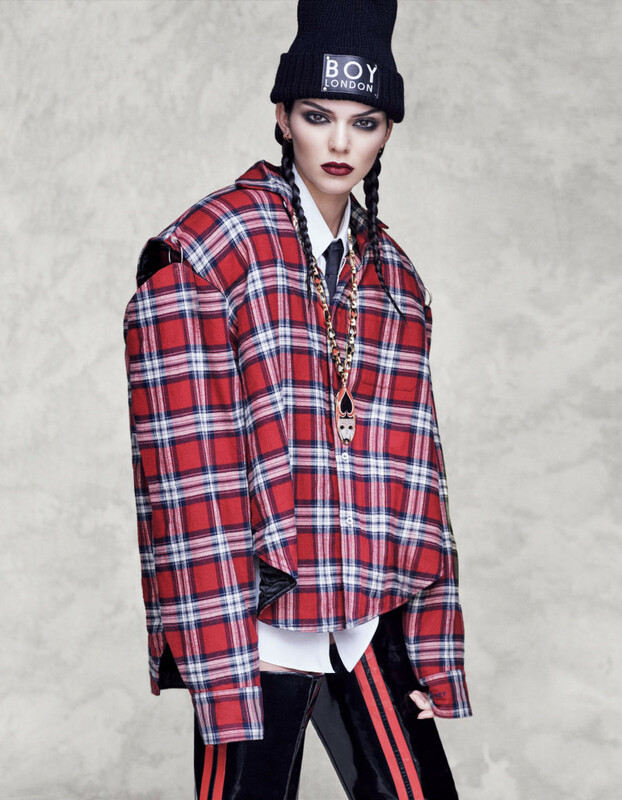 Kendall Jenner Plays Wild Party Bunny in "Rave Fashion"